/ Is Product Report Card A Scam? – Are They Legitimate? Is Product Report Card A Scam? – Are They Legitimate? Summary: Product Report Card is a survey site that pays their members via Pay Pal for taking online surveys and other online activities. They have been around for a while and do actually have many customers . In this review we will discuss what is their minimum payout, do they actually pay their customers and if there are many Product Report Card complaints. Have you been looking for ways to make money online? Is Product Report Card something that has piqued your interest as of late? If so, you’re probably wondering what Product Report Card is all about. Is it a legitimate option to make money online, or is it a scam like so many online money making opportunities? Product Report Card is a website that specializes in market research. They pay members to share their opinions through surveys and reviews Product Report Card surveys. It is very easy to get started, you simply visit their website and click “Get Started.” You will then work on creating an account and Product Report Card will actually pay you if you complete this step. The payment has varied over the years between $5.00 and $8.25, but it’s definitely a nice bonus! You can then start working on surveys and other earning opportunities, and work towards the minimum payment threshold. The whole process is pretty easy, but that doesn’t answer your question about whether or not Product Report Card is a scam or legit. So, is Product Report Card legit? Or, is it a scam company that has no intention of paying you for the hard work you’ve done. Product Report Card is definitely not a scam. They are a reputable company that has a strong reputation. There are not that many complaints about missed payments, but that does not mean that there are no Product Report Card complaints. The Product Report Card complaints center on the fact that there is a $25 minimum payout threshold. When it comes to paid survey sites, this is rather high and it can be difficult to reach this amount. This may be why Product Report Card is so willing to offer a high bonus for creating an account because they are betting on your never making it to the $25 cash out threshold. 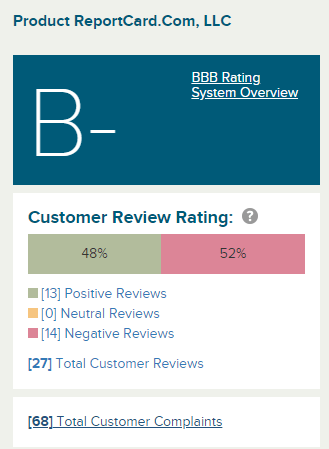 Product Report Card can be found on BBB website with B- rating. There are about 13 good reviews and 14 negative, but then there are 68 customer complaints which range anywhere from not being credited for some surveys or not getting paid etc.. The only good thing I found is that their customer support is responding to those complaints. Another Product Report Card complaint is that there are few earning opportunities. This also makes it difficult to reach the cash out minimum. So, the good news is that Product Report Card is a legitimate site, but that doesn’t mean that it is a legitimate earning opportunity for you. One of the best things about Product Report Card is that it is entirely FREE to join. You won’t pay anything to create an account, in fact, they’ll actually pay you for creating an account and finishing your profile. While it’s great that there is no financial commitment to sign up for Product Report Card, you will be spending a lot of time on the site to make any money. If you have loads of free time that’s great, but if not, don’t expect to make much, if anything. I have done many online surveys in the past and found it to be complete waste of time since you get compensated very poorly, something like $1-5 per hour. That also only first 2-3 months. After some time every survey company will make it difficult for you to qualify for surveys and you will simply give up since it will be hard to find surveys you can actually qualify for. I wrote a full article on online surveys that explains the reality behind taking online surveys. Before you commit to this program or any other survey site make sure to read it. Product Report Card is for people who have a lot of time on their hands and they aren’t looking to make it big. That’s because you will get paid very little for time consuming work. If you are trying to make a few extra bucks every month that’s one thing, but if you are seriously looking for a way to start making legitimate money online, Product Report Card is not the answer. When it comes to training, Product Report Card doesn’t provide much. That’s because you don’t need too much training for a survey site. However, the information that you do want to know—how to make the most money using Product Report Card—is right here in this Product Report Card review. The first way to make money using Product Report Card is to complete your profile. This can take up to 20 minutes, but you will get paid a bonus—between $5 and $8.25—and this is a good boost for your total income! After completing your profile, the next best way to make money is by taking surveys. This isn’t going to make you a millionaire, but you can earn a dollar or so per survey. Some pay more, so be sure to go for the larger payment surveys first. Also, even if you don’t think you’ll qualify you should still fill out the surveys because you will get paid around a dime for trying. The other way to make money—though you won’t make much—is through product reviews. You will be able to review products that you already own by uploading pictures or providing serial numbers, but this will only net you about a dollar per time consuming review. For those looking to earn a few extra dollars that are able to commit large amounts of time, Product Report Card might be a good fit. But keep in mind, you have to keep working to ensure that you’ll meet the $25 cash out threshold and most of the time you’ll only get a few surveys per day. If you are looking to earn a legitimate income, Product Report Card is not the right online earning opportunity for you.